All computer chips have something called a clock speed. This refers to the speed at which they can process data. Whether it be memory, CPUs or graphics processors, each has a rated speed. Overclocking is essentially the process by which these chips are run beyond their specifications for additional performance. This is possible because the manufacturers generally rate their chips below what they can achieve in terms of speed in order to ensure reliability for all their customers. Overclocking essentially tries to pull that extra performance out of the chips to get the full potential from their computers. Overclocking boosts the performance of a system without extra cost. That statement is a bit of a simplification because there are likely some costs involved either in buying parts that can be overclocked or dealing with the effects of overclocking components. For some, this means creating a system with the highest performance possible because they are pushing the fastest available processors, memory and graphics as far as they can go. For many others, it could mean extending the life of their current computer components without the need of upgrading them. Finally, it is a way for some people to get a higher performance system without having to spend the money it would cost to put together an equivalent level of performance without overclocking. Overclocking a GPU for gaming, for example, increases performance for a better gaming experience. How Hard Is It to Overclock? Overclocking of a system depends heavily on what components you have in your PC. For instance, many central processors are clock locked. This means that they don't have the ability to really be overclocked at all or at very limited levels. Graphics cards on the other hard are fairly open and just about any of them can be overclocked. Similarly, memory can also be tweaked like graphics but the benefits of memory overclocking are more limited compared to CPU or graphics adjustments. Of course, the overclocking of any component is generally a game of chance depending upon the quality of the components that you happen to have. Two processor with the same model number can have very different overclocking performance. One may get a boost of 10 percent and still be reliable while another could reach 25 percent or more. The thing is, you never know how well it will overclock until you try. It takes a lot of patience to slowly adjust speeds upwards and test for reliability until you eventually find your highest level of overclocking. Often when your deal with overclocking, you will see voltages mentioned. This is because the quality of the electrical signal through a circuit can be impacted by the voltages that are supplied to each. Each chip is designed to run at a specific voltage level. If the speeds of the signal through the chips is increased, the ability of the chip to read that signal can be degraded. To compensate for this, the voltage is increase which increases the strength of the signal. While upping the voltage on a part may increase its ability to read the signal, there are some serious side effects of doing this. For one, most parts are only rated to run at a specific voltage level. If the voltage levels get too high, you can essentially burn out the chip, effectively destroying it. This is why voltage adjustments are generally not something you should touch when you first start overclocking. Another effect of increasing voltage is higher power consumption in terms of wattage. This could be a problem if your computer does not have sufficient wattage in the power supply to handle the extra load from overclocking. Most parts can be overclocked to some extent without the need to increase the voltages. As you get more knowledgeable, you can experiment with slight voltage increases to help boost it but there is always risk when adjusting these values when overclocking. One of the byproducts of all overclocking is heat. All processors these days produce a fair amount of heat that they require some form of cooling on them in order to function. Generally, this involves heatsinks and fans to move air over them. With overclocking, you are putting more strain on those circuits which in terms generates more heat. The problem is that heat negatively impacts electrical circuits. If they get too hot, signals get interrupted which leads to instability and crashes. Even worse, too much heat can also lead to the part burning itself out similar to having too much voltage. Thankfully, many processors now have thermal shutdown circuits to prevent them from overheating to the point of failing. The downside is that you still end up with something that is not stable and constantly shutting down. So why is this important? Well, you have to have sufficient cooling in order to properly overclock a system or else you will have instability due to the increased heat. As a result, computers generally need to have better cooling applied to them in the form of larger heatsinks, more fans or faster spinning fans. For extreme levels of overclocking, liquid cooling systems may have to be implemented in order to properly deal with the heat. CPUs are generally going to require after-market cooling solutions to deal with overclocking. They are readily available and can vary in price depending on the materials, size, and quality of the solution. Graphics cards are a bit more complicated as you are typically stuck with whatever cooling was built into the graphics card. As a result, the general solution for graphics cards is just increasing the speeds of the fans which will increase the noise. The alternative is to purchase a graphics card that is already overclocked and comes with an improved cooling solution. In general, overclocking of computer components will generally void any warranties provided by the vendor or manufacturer. This isn't really a concern if your computer is older and past any warranties but if you are attempting to overclock a PC that is brand new, voiding that warranty can mean a huge loss if something goes wrong and there is a failure. Now there are some vendors that offer warranties that will protect you in the event of overclocking failure. For instance, Intel has their Performance Tuning Protection Plan that can pay to get warranty coverage for overclocking eligible parts. These are probably smart things to look into if you are overclocking for the first time. 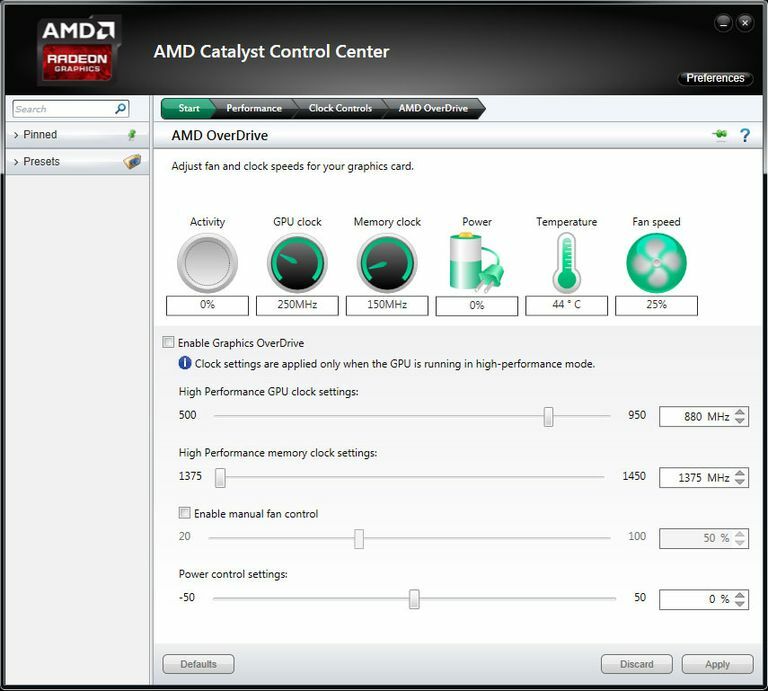 Probably the easiest component to overclock within a computer system is the graphics card. This is because both AMD and NVIDIA have overclocking tools built directly into their driver suites that will work with the majority of their graphics processors. Generally, all that is needed to overclock the processor is to enable the adjustments of the clock speed and then move a slider to adjust the clock speeds of either the graphics core or video memory. There will also typically be adjustments that allow for the fan speeds to be increased and possibly adjust the voltage levels as well. The other reason that overclocking a graphics card is fairly easy is that instability in the graphics card generally will not impact the rest of the system. A video card crash generally just requires that the system be rebooted and the speed settings returned to a lower level. This makes adjusting and testing the overclock a fairly simple process. Just adjust the slider up to a slightly faster speed and then run a game or graphics benchmark for an extended period of time. If it doesn't crash, you are generally safe and can move the slider up or keep it in the existing position. If crashes, you can then either back down to a slightly slower speed or try increasing the fan speed to try and improve the cooling to compensate for the additional heat. Overclocking of the CPU in a computer is much more complicated than the graphics card. The reason is that the CPU has to interact with all of the other components in the system. Simple changes to the CPU can cause instability in other aspects of the system. This is why the CPU manufacturers started putting in restrictions that prevented overclocking on any CPU. This is what was referred to as clock locked. Essentially, the processors are restricted to only a set speed and can't be adjusted outside of it. In order to overclock a processor these days, you have to specifically purchase a system that features to clock unlocked model. Both Intel and AMD give designations for these processors by typically appending a K to the end of the processor model number. Even with a properly unlocked processor, you also must have a motherboard with a chipset and BIOS that allows for adjustments for overclocking. So what is involved in overclocking once you have the proper CPU and motherboard? Unlike graphics cards which generally involve a simple slider to adjust the clock speeds of the graphics core and memory, processors are a bit more difficult. The reason is that the CPU has to communicate with all of the peripherals in the system. To do this, it needs to have a bus clock speed to regulate this communication with all the components. If that bus speed is adjusted, the system would likely become unstable as one or more of the components it talks with could not be able to keep up. Instead, overclocking of processors is done by adjusting the multipliers. Adjusting all of these settings was typically done in the BIOS but more motherboards are coming with software that can adjust the settings outside of the BIOS menus. The overall clock speed of a CPU is essentially the base bus speed multiplied by the multiplier of the processor. For instance, a 3.5GHz CPU likely has a bus speed of 100MHz and a multiplier of 35. If that processor is unlocked, then it is possible to set the maximum multiplier to a higher level, say 40. By adjusting it upwards, the CPU could potentially run upwards of 4.0GHz or a 15 percent boost over the base speed. Typically, multipliers can be adjusted by full increments which means it doesn't have the fine level of control that a graphics card has. This may seem pretty simple but the problem with CPU overclocking is that power is heavily regulated to the processor. This includes the voltages to different aspects of the processor as well as the total amount of power that is supplied to the processor. If any one of these is not supplying enough current, the chip will become unstable in overclocking. In addition, a bad overclock of the CPU can impact all of the other devices that it has to communicate with. This could mean that it doesn't properly write date to a hard drive. Additionally, a bad setting can make the system not boot until the BIOS CMOS is reset by jumper or switch on the motherboard meaning that you have to start over from scratch with your settings. Just like the GPU overclocking, it is best to attempt to do the overclocking in small steps. This means that you will adjust the multiplier up a few and then run the system through a set of benchmarks to stress the processor. If it is able to handle the load, then you can adjust the values again until you eventually reach a point where it becomes slightly unstable. At that point, you back off until you are completely stable. Regardless, make sure to note your values as you test in case you have to do the CMOS reset.